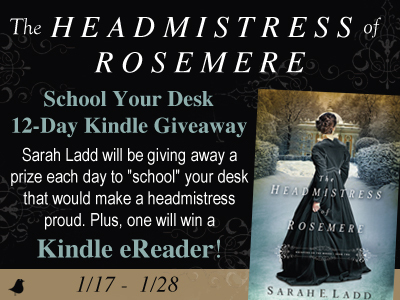 The Headmistress of Rosemere Giveaway and Facebook Party! 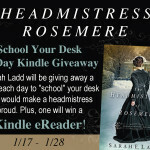 Home→Uncategorized→The Headmistress of Rosemere Giveaway and Facebook Party! Taking a break from my break 🙂 to fulfill some promises to post. I hope your new year is going well. 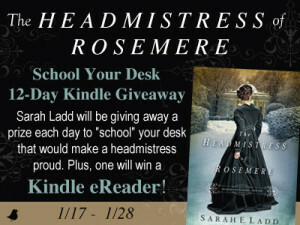 Don’t miss Sarah Ladd’s latest Regency novel, The Headmistress of Rosemere. She is celebrating the release of book two in her Whispers on the Moors series with a fun “School” Your Desk Kindle Fire Giveaway and an Author Chat Facebook Party! DON’T MISS A MOMENT OF THE FUN; RSVP TODAY. HOPE TO SEE YOU ON THE 28th! My review: I found The Headmistress of Rosemere to be a sweet story with lots of conflict to keep the reader wondering what is going to happen next. I like that Patience doesn’t really live up to her name. 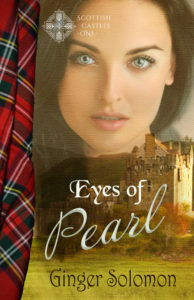 The romance is secondary to the story, which made it seem a bit slow to me, but the excellent writing made it interesting enough to keep me reading.